The adult white-sided dolphin while getting herded. A dolphin herded Sunday from shallow water into Boston Harbor has not yet been spotted, which is a good sign, according to the New England Aquarium. “In this case, when we release a dolphin this way, no news is good news,” said Tony LaCasse, an aquarium spokesman. The adult white-sided dolphin was herded during a several-hour effort after it spent the night stranded in shallow water off Winthrop’s Coughlin Park, the Globe reported. The dolphin was stranded with a female dolphin that had died overnight, according to the Globe. The herded dolphin’s outcome is uncertain because of how dolphins can experience shock from a stranding, LaCasse said. “When a dolphin strands, they are not intended physically to lay on hard surfaces. They are buoyant in the water,” LaCasse said, adding that dolphins’ vital organs are not protected in these situations. The aquarium had a scare Monday morning when it received reports of a dolphin-like creature in Charlestown. 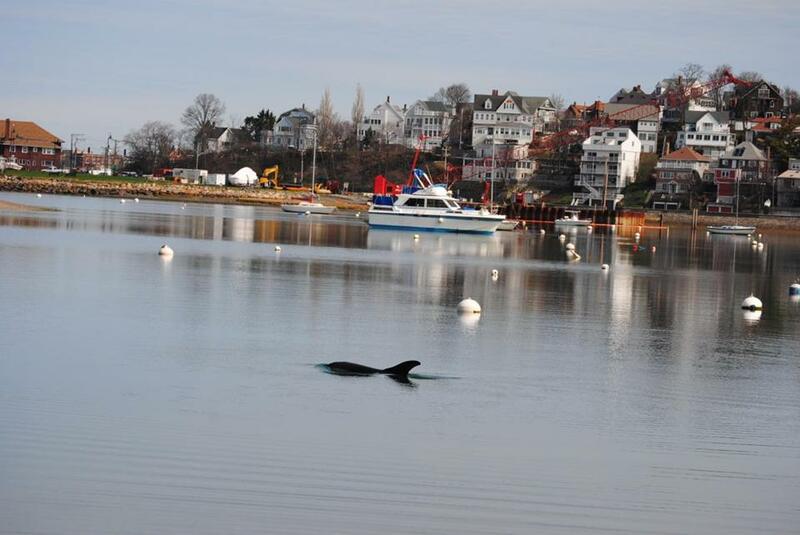 This creature ended up being a harbor porpoise, which are common in Boston Harbor this time of year, LaCasse said. “We would be really concerned to have a dolphin in that area,” he said, referring to the water’s conditions. The necropsy on the deceased female dolphin will take place sometime this week, LaCasse said.